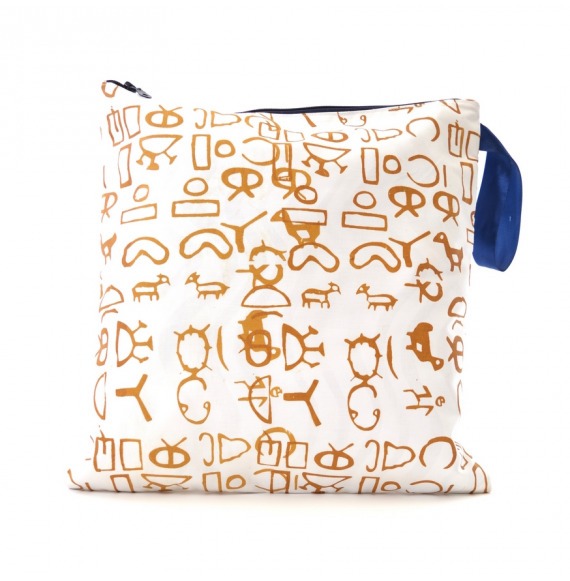 Travel in style with our unique Toiletry Bag made of cotton and a hand printed organic silk-screen design. Waterproof, lightweight and foldable – with this bag, you won’t have to leave anything behind! Size: 13 in. x 8 in. This is the perfect “let me take care of you” bag! Like to keep your undies separate? Then this is your easy-to-carry lingerie bag. A swim before you return home? Your wet bathing suit will not be a problem. Beautiful, and yet so practical. Made of organic cotton, hand printed silk-screen design. Size: 13.4 in. x 13.4 in. Your cotton cloth table runner is handwoven and dyed with traditional plant-dyeing techniques. Each design is unique ! Size: 15.5 in. x 98 in. Thick woven cotton died with Indigo (plant dye) and with a cotton silkscreen print in organic dyes. 55 cm around X 25,5 cm high. Perfect for your shampoos and larger toiletry items !